The Chapel of St Peter and St Paul can be found at the Royal Naval College in Greenwich. Of all the panoramas I have taken this is one of the most stunning due to the fabulous internal detail of the building. The Chapel was designed by Christopher Wren and Thomas Ripley but it is not in its original form as in 1779, fire gutted the building. After the fire it was redesigned by “Athenian” Stuart and William Newton creating the building we see today. Notable features in the Chapel are the painting above the altar entitled ‘The Preservation of St Paul after Shipwreck at Malta’ by American painter Benjamin West. The Chapel has an open service every Sunday at 11am and is well worth a visit, it is also open to the general public during the week and over the weekend. 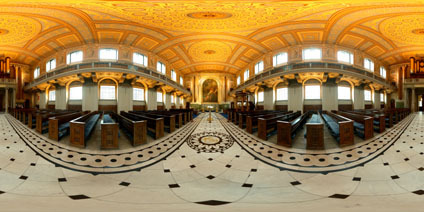 View the Quicktime panorama of The Chapel of St Peter and St Paul , London (2.4mb).